Ms. Chris Stockwell and Mr. Chris Laubach are one of Compass’ most dynamic husband/wife Realtor teams. She has been a successful agent in Chicago since 2008. And he brings 3 decades of ad agency experience to the team. Her many years in this business combined with his savvy marketing ability make them a uniquely well-rounded duo. In this increasingly competitive real estate market, they have become experts in pre-listing, private listing, and agent-to-agent selling, giving an edge to both their buyers and sellers before properties even hit the public Multiple Listing Service – the MLS. Chris and Chris are born communicators, relentlessly detail-oriented, and driven to offer their clients the very best experience. Consistently in the top 10% of agents in the city, they are members of Chicago's Top Agent Network. They pride themselves on presenting a high level of service whether they’re helping a client buy a $70,000 condo, sell a $2 million single family home, or navigate the complexities of selling a double lot that included a landmark-protected house and a 3-flat of rental apartments! Their past clients have described them as “honest, clearly very dedicated, focused, crazy smart, extremely knowledgeable, caring about their clients…and fun to work with.” Plus, they have long-standing relationships with preferred mortgage brokers, lawyers, inspectors, photographers, home stagers, and handymen who they trust to bring on to their team. Chris & Chris are especially helpful with first-time buyers. And they relate very well to empty-nesters like themselves who are down-sizing or moving back from the ‘burbs to the city. 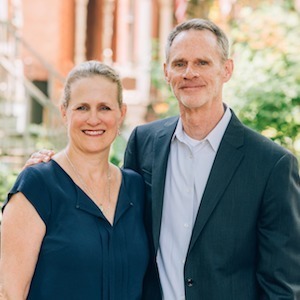 As homeowners in Chicago for 30 years, Chris & Chris have owned and rented homes and apartments in the Old Town, Sheffield DePaul, and Ranch Triangle neighborhoods of Lincoln Park. But they know and appreciate the numerous and wonderful areas all around Chicago, all with their own unique and interesting flavors. Their specific areas of expertise are the neighborhoods of: Lincoln Park, Lakeview, Wrigleyville, North Center, Roscoe Village, Ravenswood, Lincoln Square, Andersonville, Logan Square, Bucktown, Wicker Park, Ukrainian Village, West Town, West Loop and South Loop. But they have also happily done deals in Hyde Park, Oak Park, and Evanston (where Chris Stockwell just happened to grow up). "Chris and her husband Chris were great to work with! We sold our house in Lincoln Park with them, which was not easy. We were selling at an unfortunate time for sellers at our price point, and Chris was very helpful in showing us market analyses and discussing strategies for dealing with the downturn. She was very knowledgeable about current trends and sales in the neighborhood and quick to pass along any information that could be useful. Chris and Chris were great about responding to questions promptly, making valuable suggestions, and giving us advice but ultimately being fully supportive of whatever decision we ended up making. Chris was helpful at every step of the process and did everything she could to get our house sold in spite of the market conditions. We would certainly recommend Chris to anyone looking to sell their house in Chicago. "–Jeff G.
"They say it takes a village. When my husband and I were looking to upgrade from our condo to a single-family home, it took a team – Team Chris & Chris of Coldwell Banker, to be exact. We had the good fortune to work with both of them on different aspects of our sale and search. Chris L. handled the sale of our condo, and his marketing background was put to excellent use crafting sales materials to drive interest in our unit. We appreciated his positivity, energy and enthusiasm. Chris S. helped us with our home search. Her patience and encouraging words helped us keep the faith that "our home" was out there. And her expert guidance helped us ultimately navigate the negotiations process to land "the one". We always felt comfortable bringing questions and suggestions to either of them, and they were always willing to work with us to make sure we were happy with how the sale and purchase were going. In addition to their expertise, Chris and Chris have a wealth of professional resources they can recommend for other aspects of this process. From lenders and attorneys to contractors and more. We always felt we had the A-team working for us. And you will, too. "–Jillian D.
“Chris S. and Chris L. navigated us through the weirdest waters we ever could've imagined, and we still came out saying, "that was fun!" Our situation was unique in many ways (timing, layout, neighborhood), but we felt confident following Chris and Chris's honest guidance...from the first day to the final closing. They understood how special our home was to us and made sure to find buyers who would feel just as lucky to own it as we did. In fact, they helped work out a lease-to-own deal that made "everybody wins!" a theme for the entirety of the contract. It was far from a cookie-cutter approach. Above-and-beyond is the way they roll. Expect nothing less from Chris & Chris!”–Bree S.
“When the Rogers Park property we’d been dreaming of came on the market after 18 months of waiting, Chris and Chris helped us pounce. Not only did we get it—we were living there six weeks later! Without quelling our enthusiasm, Chris and Chris made certain we were educated about the building, the condo association, and condo ownership in general. This dynamic duo is experienced and knowledgeable, and advocated for us at each turn, responding immediately to every one of our numerous emails and calls. Chris and Chris demonstrated their interest was in our long-term happiness rather than in making a sale. Though we can’t imagine wanting to leave our new home, when that day comes we will work with them again. Meanwhile, we are recommending Chris and Chris to anyone looking for great residential real estate agents.”–Susan N.
"We found Chris and Chris through a somewhat exhaustive online search (we considered where agents had recently bought and sold and in what price range, as well as client reviews), and out of the three agents we spoke to, felt most comfortable and excited about working with Chris and Chris. In the next few weeks, we spent many hours with both Mr. and Mrs. Chris- they accommodated our schedules to meet with us for evening and weekend showings, answered our emails promptly, and truly made us feel like a priority! We were always impressed with their knowledge, professionalism, and follow-up. They provided helpful insights that, as first-time homebuyers we might not have thought of ourselves, but also considered our insights without any inkling of condescension. They negotiated the best price for our home, while making sure our offer was most attractive to the sellers, since there were multiple other offers. They helped ensure that the closing process would be as smooth as possible, and have continued to be supportive after our closing- with recommendations for contractors, neighborhood updates, and general check-ins to see how things are going. We would most definitely recommend them to anyone looking to buy a home in Chicago! "–Elizabeth N.
"We loved working with Chris Stockwell, and her husband and partner Chris Laubach, to purchase our new home in Portage Park. As first time homebuyers, what we loved most about Chris & Chris was that we never once felt pressured to make a move we didn't feel comfortable with. After working with Chris S. for a couple of months, we actually decided to rent another year. After the lease was up, we went back to Chris (promising this time we were serious about buying : ) She was happy to start our search again, and never once made us feel uncomfortable about seeing too many places, and taking our time with the purchase. Once we found a property we liked, we pounced, and of course, this being Chicago, the process went very quickly, and thanks to Chris & Chris, very smoothly. We loved being able to email or text them to ask their advice and opinions throughout the search, offer, and closing. And overall, they're just inherently kind, friendly, funny and calm people! Which makes a potentially stressful situation much easier. I would definitely recommend them! "–Sarah L.